Ever had this happen to you? You need a file fast, but it's in a storage box—tucked way under other boxes. Gee, if the box just opened from the side, this wouldn't be a pain. Paige hates pain. That's why we offer the Side Tab Box. We even put a button-tie closure on it to make it easy to open again and again without wearing out the tabs. Get in. Get your file. And get on with your day. Front-loading easy access to file folders. No removing boxes from shelves. 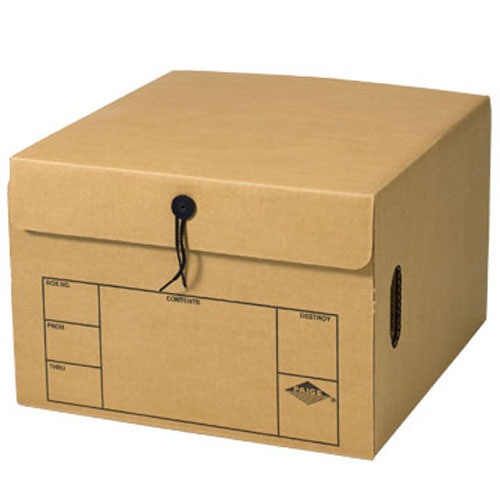 Button-tie closure keeps documents secure, without wear and tear from opening and closing the box.